The LED flashes when the battery is charged . 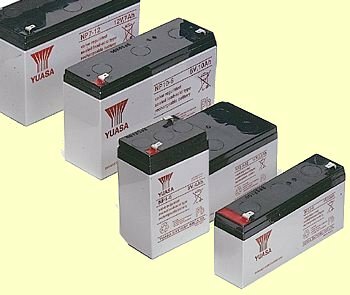 . .
Before we go into the operation of the SLA Battery Charger circuit, there are a number of points we need to cover about the care and use of Sealed Lead Acid batteries. The words Sealed Lead Acid covers a number of batteries that do not have a "filling hole." You cannot get to the electrolyte and the battery can be used in any position. This discussion also covers AGM batteries (Absorbed Glass Mats) that have a separator between the plates and the electrolytic is thick and will not spill. Another type: GEL CELL and FLOODED LEAD ACID all have the same or similar charging requirements and can be used with this charger because it is a low-current charger (about 300mA) and will not damage anything. It also has the feature of providing pulses to the battery when 13.4v is detected and this will eventually fully charge any battery and keep a it fully charged for months, and even years. Firstly, Sealed Lead Acid batteries must be charged, discharged and stored very carefully. We normally think batteries can be stored for months (if not years) and they will be available for immediate use. This is not the case with SLA batteries. If you store a NEW, full charged SLA battery for 6 months or more, you will find it may be fully discharged. You may also find you cannot charge it!! It may be worthless. That's how delicate SLA batteries are. They must be charged on a regular basis to prevent them discharging to a very low voltage level. If the terminal voltage of a SLA battery is allowed to go below 8v, a process called SULPHATION starts to cover the surface of the plates and prevents the battery being re-charged. The internal resistance of the battery increases and it becomes useless. More on this at the end of the article. This action turns on the PNP transistor in the "Turn ON" block. The resistance between the collector-emitter terminals decreases and the indicator LED comes on. The path to the bottom rail of the circuit goes through a signal diode, the gate-cathode junction of the SCR and through two 1R8 resistors in parallel. This is why the LED illuminates. Before we go any further, the circuit works on an AC plug pack. It must be an AC supply as we do not want any electrolytics to be present on the power rail as this will allow a very high charge-current to flow and possibly damage the SCR. A DC supply will not allow the SCR to turn off, as it turns off when the current through it falls to zero. THE CIRCUIT IS A HALF-WAVE RECTIFIER! The circuit is actually a half-wave rectifier. It only charges the battery on every half cycle. The plug pack doesn't like this as it leaves residual flux in the core of the transformer and causes it to overheat. But that's the only drawback with the circuit. The SCR turns on during each half cycle and current flows into the battery. A voltage is developed across the two 1R8 resistors (in parallel) and this voltage is fed into the 47u electrolytic. It charges and turns on the BC547 transistor. The transistor robs the SCR of gate voltage and the SCR turns off. The energy in the 47u feeds into the transistor but after a short time it cannot keep the transistor turned on. The transistor turns off and the SCR switches on and delivers another pulse of current to the battery. As the battery charges, its voltage increases and this is monitored by the "Voltage Monitor" block. The circuit is very complex and one way to look at the operation is to consider the top rail as a fixed rail and as the battery voltage increases, the rail connected to the negative terminal of the battery is pushed down. This lets you see how the "Turn On" transistor is activated and how the "Voltage Monitor" components create voltage drops across each of them. The "Voltage Monitor" components consist of a transistor and zener diode as well as an 8k2 resistor, the 1k pot, a 1k5 resistor, a 150R resistor and a signal diode. The signal diode is actually part of the flasher circuit and we discuss its operation later. As the voltage across the battery increases to 13.4 volts, each resistor in the "voltage detecting network" will have a voltage drop across it that corresponds to the resistance of the resistor. The diode will have a constant 0.7v across it. The voltage on the wiper of the pot will be about 3.25v and the voltage across the zener will be 10v. This leaves 0.6v between the base and emitter of the Voltage Monitor transistor. This voltage is sufficient to turn the transistor ON. When the Voltage Monitor transistor turns ON, it robs the "Turn On" transistor of base-emitter voltage and the circuit turns off. The SCR has only two states: ON and OFF. During the half-cycle when it is turned on, the battery gets a high pulse of current and the current is only limited by the capability of the plug pack. 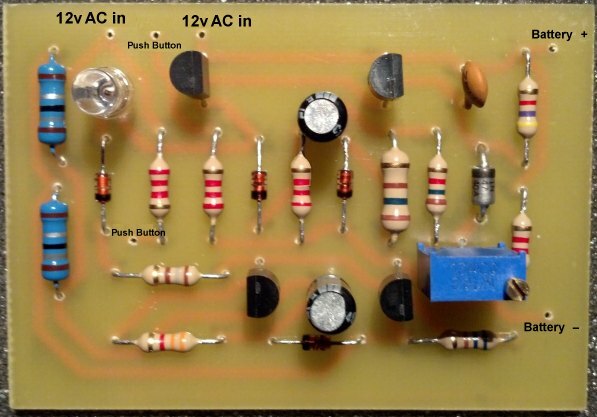 There are no electrolytics to allow very high pulses of current to be delivered and this is fortunate as the SCR is only a 0.8 amp device, but will endure surges of 10amp for half a cycle. Whenever the SCR is triggered into conduction during the half cycle of its operation, it remains in conduction until the voltage delivered by the plug pack falls to zero. This is when the SCR turns off. When the plug pack delivers a negative voltage to the top rail and a positive voltage to the lowest rail, the SCR is not triggered into conduction and none of the components in the circuit deliver current to the battery. The SCR delivers current for a few half-cycles and then it is turned off for a few cycles. This is how the average current delivered to the battery is controlled. The circuit is designed to deliver about 300 - 400 mA average charge-current. The maximum value is determined by the 1R8 resistors. They do not allow any more than 900mA to flow during a half-cycle and if this current flows, the lower 47u is charged and the lower transistor turns on to prevent the SCR turning on. When the battery is fully charged, the indicator LED begins to flash. The flashing is produced by the 2k2 resistor and 47u (connected to the voltage monitor section). When the battery is charging, the 47u is charged via the diode connected to the BC557 transistor and through the 150R and signal diode to the negative of the battery. When the battery is fully charged, the Voltage Monitor section turns ON and turns off the "Turn ON" section. This removes the voltage on the positive side of the 47u and the positive side is brought to the negative rail via the 2k2 resistor. This brings down the negative side of the 47u and the 150R resistor is allowed to drop below the negative rail due to the presence of the diode, as the diode becomes reverse-biased. This holds the circuit in the "off" condition, as the voltage monitor section sees an extra voltage across it and thinks the battery it is "over-charged." The 47u discharges and the circuit turns ON to pump a small burst of current into the battery to keep it charged. This is called "Trickle Mode" or "Pulse Mode." Charge a battery and when the voltage reaches 13.4v, adjust the pot so the LED flashes. The circuit will not turn on if the voltage of the battery you are charging is less than 4 volts. on each cell and the circuit will take over in the normal way once the voltage rises more than 4 volts. If you have a battery that does not charge, even after you have pressed the push button, don't waste your time. If it has been standing for more than 6 months in an uncharged state, it will not charge. This charger is ideal in determining if a battery is able to be charged. Just connect it to the charger and monitor the voltage across the battery. If it remains at less than 8v after 1 hour, the battery is scrap. You can easily test a battery by putting a 12v car globe across the terminals. Even a tail light globe will require a current of more than 1 amp to get it to glow and if the battery cannot deliver this current, it is DEAD. The only "dead" battery that can be recovered is one that has been connected to equipment and is totally exhausted. The equipment has exhausted the battery. If you charge it within a few weeks, the process of "sulphation" will not have damaged it and it can be fully charged. If the battery is "dead" due to standing for a long time, the chances of recovery are virtually nil. Sealed batteries have the acid either gelled or put into a sponge-like glass mat. They have the advantage/disadvantage of being completely liquid-tight. They can operate in any position, even sideways or upside down, and will not leak acid. Because the electrolyte moves more slowly, these batteries cannot tolerate high rates of charging or discharging for extended periods, although their thinner plates will allow high rates for a short time. Their sealed construction, which makes them ideal for some limited applications, makes it impossible to check individual cell conditions with a hydrometer. Although these cells are "sealed," they do have vents to prevent pressure build-up in case of gassing. Many PV charge controls will push charging voltage too high for sealed batteries. Premature failure will result due to loss of water vapor. We recommend sealed batteries only in situations where hydrogen gassing during charging cannot be tolerated, or the battery is going to be moved and handled a great deal, or in conditions where the battery needs to fit into unique, tight spaces. Boats, UPS computer power supplies, and remote expeditions are the most common uses. Special lower voltage charge controls must be used with these batteries. Life expectancy is two to five years for most AGM (absorbed glass mat) batteries, and five to ten years for the higher quality, but more difficult to manufacture, gel cell batteries. Most sealed batteries are AGM types. You can clearly see the track-work under the board and it is easy to copy the layout and produce your own board. The board was produced by Tom Kelly. You can email him for the file so you can make your own PC board. Here's how to set up the project to charge a battery. The 12v battery used in the test was a 12v 1.2 amp-hr SLA with a suggested maximum charging voltage of 14.4v. The charger does not "turn on" with a flat battery so it needs to have some voltage across the terminals. Connect the battery to the charger and across the battery put all the electrolytics. Now connect the multimeter to the terminals. Make sure you can disconnect JUST the battery for the SETTING UP. Turn ON the charger and the voltage across the battery will be anything above say 5v. Now disconnect the battery and the voltage across the electrolytics will rise to 14.4v. If not, turn off the charger, adjust the pot slightly and discharge the electrolytics with a 100R resistor. Now start again. Don't "short" the electro's or you will blow up the charger if it is still connected. If you can partially charge the electro's, with say a 6v battery, you can use just use the electro's as the charger will not start if the electro's do not have a voltage across them.